Our lodgings in Jindabyne are nicely located on the lakeside, with lovely serene views over the grounds down to the lake. On our first morning here, right on the dot at 9:00am a huge roar started coming from the lake. Looking down to the lake we could see lots of fancy speedboats racing around the lake with water skiiers in tow. 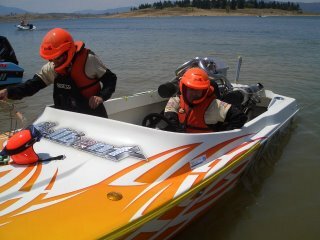 We discovered today that Jindabyne hosts the Australian National Speedboat Championships every year. The boats are something else, this is really a sport for only the very well heeled. I don't know how those water skiiers can hold on at the speeds they're doing, truly amazing! Is that well heeled or well shod? I guess if you were a barefoot skier having very thick heels would be a blessing, but, if you're a traditional skier, being kitted out with a good ski would probably be better than thick heels!! !